Chrome Rocker Shaft End Plug and Cap Nut Kit. Rocker shaft end plug has 5/16" X 24 thread pitch. 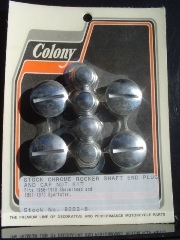 Fits Shovelhead models 1966 – 1970. Fits Sportster models 1957 – 1970. Replaces OEM #'s 17448-57, 6466W, 7872, & 7875.